These treated stones are called laser drilled diamonds. Here’s how the treatment is done. First a very tiny laser hole is drilled to access an unsightly inclusion. Once a passageway has been opened up, the diamond is boiled in acid or other chemicals to bleach the inclusion. Sometimes the inclusion is removed by burning it away with the laser. Laser drilling diamonds will leave a small, but detectable tunnel from the surface to the inclusion in addition to the original inclusion, which is now less visible. Despite the additional tunnel, the fact that you can no longer see the prominent black inclusion improves the apparent clarity grade of the diamond. The tunnel in a laser drilled diamond is so small, just 20-25 microns in diameter, that it doesn’t affect the weight of the diamond. It’s smaller than the width of a hair. The change in appearance of the laser drilled diamond is permanent. GIA will grade laser-drilled diamonds, marking the laser drill holes on the inclusion plot. According to the Federal Trade Commission, the laser drilling of diamonds must be disclosed to consumers. Laser drilled diamonds are not as rare as diamonds that have naturally high clarity so they sell for less than diamonds that haven’t been treated. Many people just don't want to buy treated diamonds. Laser-drilled diamonds can be more fragile than non-laser drilled diamonds because the tunnel created by the laser weakens the structure of the crystal. Dirt can also become trapped in the tunnel, making it more visible. That means that there is an incentive for unscrupulous people to try to hide the fact that a diamond is laser-drilled. 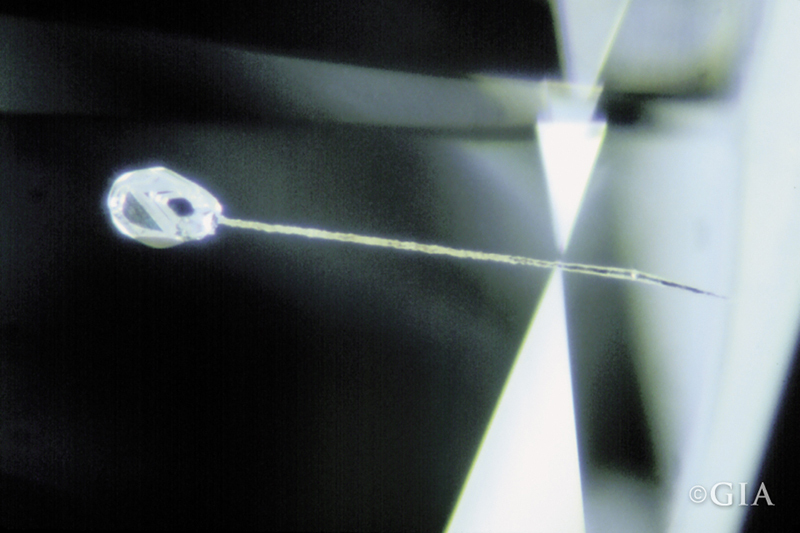 In a special kind of laser drilling, instead of burning a tiny tunnel to reach the black inclusion, a microscopically thin plane is burned through the diamond until it reaches the black inclusion. This kind of laser-created inclusion is larger than the tunnel left behind by the regular laser drill, but it is much more natural looking and harder to detect. It also leaves more open space in the diamond, space that can be filled by a glassy resin that makes it less easy to see. When diamonds have inclusions, either naturally occurring or made by laser drilling, the result is a fracture filled diamond. Fracture filling diamonds started in the 1980s. When surface-reaching fractures are filled with the glassy resin, they become more difficult to see, improving the apparent clarity grade of a diamond. Gemologists and diamond laboratories can detect the filling material because it displays a flash effect when the fractures are examined under magnification. The Gemological Institute of America and the American Gem Society, the two most respected diamond grading laboratories, will not grade fracture-filled diamonds because this treatment is not permanent. It can degrade and discolor over time and can also be damaged or removed during jewelry setting, sizing, repairs, and cleaning. If you do decide to buy a laser drilled diamond, make sure you let your jeweler know whenever you bring it in for cleaning, jewelry repair, or sizing because treated diamonds are more easily damaged. Use caution with ultrasonic and steam cleaning. Repolishing clarity enhanced diamonds is also not recommended. ROSI doesn’t recommend buying laser drilled diamonds. Buying a diamond that looks one clarity grade better than it actually is isn’t worth the stigma attached to a treated diamond. Because laser drill holes may contain fracture filling, these diamonds may not be as durable as normal diamonds. You’ll have to tell everyone who works on your ring that it is enhanced and tell your heirs to take extra care of the treated stone. We don't think all the hassle is worth it. If your budget is limited, it’s better to trade off on color or size and buy an all-natural untreated diamond.